Agomelatine (S20098) displayed pKi values of 6.4 and 6.2 at native (porcine) and cloned, human (h)5-hydroxytryptamine (5-HT)2C receptors, respectively. It also interacted with h5-HT2B receptors (6.6), whereas it showed low affinity at native (rat)/cloned, human 5-HT2A (<5.0/5.3) and 5-HT1A (<5.0/5.2) receptors, and negligible (<5.0) affinity for other 5-HT receptors. In antibody capture/scintillation proximity assays, agomelatine concentration dependently and competitively abolished h5-HT2C receptor-mediated activation of Gq/11 and Gi3 (pA2 values of 6.0 and 6.1). As measured by [3H]phosphatidylinositol depletion, agomelatine abolished activation of phospholipase C by h5-HT2C (pKB value of 6.1) and h5-HT2B (pKB value of 6.6) receptors. In vivo, it dose dependently blocked induction of penile erections by the 5-HT2C agonists (S)-2-(6-chloro-5-fluoroindol-1-yl)-1-methylethylamine (Ro60,0175) and 1-methyl-2-(5,8,8-trimethyl-8H-3-aza-cyclopenta[a]inden-3-yl) ethylamine (Ro60,0332). Furthermore, agomelatine dose dependently enhanced dialysis levels of dopamine in frontal cortex of freely moving rats, whereas they were unaffected in nucleus accumbens and striatum. Although the electrical activity of ventrotegmental dopaminergic neurons was unaffected agomelatine, it abolished their inhibition by Ro60,0175. Extracellular levels of noradrenaline in frontal cortex were also dose dependently enhanced by agomelatine in parallel with an acceleration in the firing rate of adrenergic cell bodies in the locus coeruleus. These increases in noradrenaline and dopamine levels were unaffected by the selective melatonin antagonist N-[2-(5-ethyl-benzo[b]thien-3-yl)ethyl] acetamide (S22153) and likely flect blockade of 5-HT2C receptors inhibitory to frontocortical dopaminergic and adrenergic pathways. Correspondingly, distinction to agomelatine, melatonin showed negligible activity 5-HT2C receptors and failed to modify the activity of adrenergic and dopaminergic pathways. In conclusion, in contrast to melatonin, agomelatine behaves as an antagonist at 5-HT2B and 5-HT2C receptors: blockade of the latter reinforces frontocortical adrenergic and dopaminergic transmission. Melatonin, which is generated by the pineal gland, is an endogenous synchronizer of biological rhythms in mammals: its secretion and actions are tightly related to seasonal and light/dark cycles (Reppert, 1997; Borjigin et al., 1999). This chronobiotic role of melatonin has attracted considerable attention within the framework of depressive disorders inasmuch as they are aggravated by a disturbance of daily rhythms and sleep patterns (Souetre et al., 1989). Furthermore, melatonin is active in several experimental models of antidepressant activity: notably, in a “chronic mild stress” paradigm in which diurnal and sleep rhythms are disrupted (Overstreet et al., 1998; Kopp et al., 1999). Although the relationship between melatonin levels and clinical depressive states is unclear, decreases have been reported (Szymanska et al., 2001; Tuunainen et al., 2002). Furthermore, antidepressant treatment enhances melatonin levels, reflecting actions of noradrenaline (NA) at pineal β-adrenoceptors facilitatory to its secretion (Borjigin et al., 1999; Skene et al., 1999; Szymanska et al., 2001). Melatonin acts via MT1 and MT2 receptors (Reppert, 1997; Borjigin et al., 1999), both of which control circadian rhythms (Liu et al., 1997). The novel agonist agomelatine (S20098) possesses nanomolar affinity for MT1 and MT2 sites (Yous et al., 1992; Ying et al., 1998) and modulates circadian rhythms in rodents (Redman and Francis, 1998; Ying et al., 1998; Van Reeth et al., 2001). It is in phase III clinical trials for the management of major depression and is active in certain rodent models predictive of antidepressant properties (Bourin et al., 2002; Papp et al., 2003), actions difficult to attribute exclusively to its engagement of MT1/MT2 receptors. Agomelatine possesses high overall selectivity (>100-fold) for MT1 and MT2 receptors compared with other sites (pKi values of <5.0 at >50 sites; D. Cussac, unpublished observations). However, a binding “screen” suggested that it may interact with 5-HT2C receptors. This observation is of considerable interest inasmuch as 5-HT2C receptors are implicated in the etiology and treatment of depressive states. Thus, 5-HT2C receptors are enriched in the frontal cortex, hippocampus, basal ganglia, and other structures implicated in the mood, motor, and cognitive deficits that accompany depressive states (Sharma et al., 1997; Lopez-Gimenez et al., 2002). Many clinically active antidepressant agents, such as mianserin, mirtazapine, and amitriptyline, behave as antagonists at 5-HT2C receptors (Jenck et al., 1994; Millan et al., 2000a), whereas long-term administration of 5-HT reuptake inhibitors results in their down-regulation (Bristow et al., 2000). Notably, in contrast to their 5-HT2A and 5-HT2B counterparts, 5-HT2C receptors exert a tonic, inhibitory influence upon frontocortical dopaminergic and adrenergic pathways, the activity of which is compromised in depressive states (Di Giovanni et al., 1999; Gobert et al., 2000; Millan et al., 2000b). Indeed, via contrasting mechanisms, a common property of all clinically active antidepressant agents may be an increase in extracellular levels of NA and dopamine (DA) in the frontal cortex (FCX) of rodents (Millan et al., 2000b). In light of the above-mentioned observations, the present study had two major and interrelated aims. First, to characterize the interaction of agomelatine with 5-HT2C receptors both in vitro and in vivo; and second, to examine its influence upon ascending monoaminergic pathways that, as outlined above, are subject to a tonic, inhibitory control by 5-HT2C receptors. In all procedures, the actions of agomelatine were compared with those of melatonin. Animals. In vivo studies used male Wistar rats (225-250 g for dialysis studies and 120-140 g for behavioral studies). They were housed in sawdust-lined cages with unrestricted access to food and water. Laboratory humidity was 60 ± 5% and temperature 21 ± 1°C. Lights were on from 7:30 AM to 7:30 PM. Animals were adapted for at least 1 week to laboratory conditions before use. All animal use procedures conformed to International European Ethical Standards (86/609-EEC) and the French National Committee (décret 87/848) for the Care and Use of Laboratory Animals. Competition Binding Assays. Binding affinities at h5-HT2A, h5-HT2B, and h5-HT2C receptors stably transfected into Chinese hamster ovary (CHO) cells were determined essentially as described previously (Cussac et al., 2002b) by competition binding with [3H]ketanserin (0.5 nM; Amersham Biosciences, Inc., Les Ulis, France) (h5-HT2A receptors) or [3H]mesulergine (1 nM; Amersham Biosciences, Inc.) (h5-HT2B and h5-HT2C receptors) in a buffer containing 20 mM HEPES pH 7.5, 2 mM EDTA, and 0.1% (w/v) ascorbic acid. Incubations lasted 2 h at 22°C and nonspecific binding was defined by 10 μM 5-HT for h5-HT2B receptors and 10 μM mianserin for h5-HT2A and h5-HT2C receptors. Binding affinities at native, rat 5-HT2A (frontal cortex), and porcine 5-HT2C receptors (choroid plexus) were determined by standard techniques using 0.5 nM [3H]ketanserin and 1.0 nM [3H]mesulergine, respectively, as radioligands (Millan et al., 2000a). Binding affinities at 5-HT1A receptors in membranes from rat hippocampus and from CHO cells stably expressing recombinant h5-HT1A receptors (PerkinElmer Life Sciences, Boston, MA) were determined essentially as described previously (Newman-Tancredi et al., 1997) by competition binding with 0.4 nM [3H]8-hydroxy-2-dipropylaminotetralin (Amersham Biosciences, Inc.). Nonspecific binding was defined using 10 μM 5-HT. Experiments were terminated by rapid filtration through Unifilter-96 GF/B filters (Whatman, Maidstone, UK) (pretreated with 0.1% polyethylenimine) using a Filtermate harvester (PerkinElmer Life Sciences). Radioactivity retained on the filters was determined by liquid scintillation counting using a Top-Count microplate scintillation counter (PerkinElmer Life Sciences). Nonlinear regression analysis of isotherms was undertaken by Prism software (GraphPad Software, Inc., San Diego, CA) to yield inhibitory concentration 50 (IC50) values. These were transformed into Ki values according to Cheng-Prusoff equation: Ki = IC50/(1 + L/KD), where L corresponds to the radioligand concentration and KD its dissociation constant. Activity at h5-HT2C Receptors Coupled to Gq/11 and Gi3: Scintillation Proximity Assays. Most studies of coupling at 5-HT2C receptors have focused on their stimulation of Gq/11 (Gerhardt and Heerikhuizen, 1997; Cussac et al., 2002a). However, they can also engage the Gi protein family (Alberts et al., 1999; Cussac et al., 2002a). Inasmuch as individual ligands differentially influence specific G proteins by “agonist-directed trafficking” (Berg et al., 1998), we determined the influence of agomelatine upon both Gq/11 and Gi3 using novel, antibody capture-based scintillation proximity assays (SPAs) (Cussac et al., 2002a). The stimulation of guanosine-5′-O-(3-[35S]thio)-triphosphate ([35S]GTPγS) (1332 Ci/mmol; PerkinElmer Life Sciences, Paris, France) binding at Gq/11 and Gi3 was measured as described previously (Cussac et al., 2002a). CHO-h5-HT2C membranes (∼20-30 μg/well) were preincubated for 30 min with agomelatine (or melatonin) with or without 5-HT in a buffer containing 20 mM HEPES pH 7.4, 0.1 μM GDP, 50 mM MgCl2, and 150 mM NaCl. The reaction was started with 0.2 nM [35S]GTPγS in a final volume of 200 μl in 96-well plates for 60 min at room temperature. Specific activation of different subtypes of G protein was determined using an SPA approach as described by DeLapp et al. (1999) and Cussac et al. (2002a). At the end of the incubation period, 20 μl of Nonidet P-40 (0.27% final concentration) was added to each well, and the plates incubated with gentle agitation for 30 min. Antibodies specific for Gq/11 (1.74 μg/ml final dilution) and Gi3 (0.87 μg/ml final dilution) were added to each well in a volume of 10 μl before 30 min of additional incubation. SPA beads coated with secondary anti-rabbit or anti-mouse antibodies (Amersham Biosciences UK, Ltd., Little Chalfont, Buckinghamshire, UK) were added and the plates incubated for 3 h with gentle agitation. The plates were then centrifuged (10 min, 1300g) and radioactivity detected on a PerkinElmer Life Sciences Top-Count microplate scintillation counter. Isotherms were analyzed by nonlinear regression using the program PRISM (GraphPad Software, Inc.) to yield effective concentration (EC50) and IC50 values. KB values of agomelatine and melatonin for inhibition of 5-HT-stimulated [35S]GTPγS binding were calculated as described previously (Cussac et al., 2002a): KB = IC50/(1 + (agonist/EC50)), where IC50 is inhibitory concentration50 of antagonist, agonist is concentration of 5-HT, and EC50 is effective concentration50 of 5-HT alone. In additional antagonist studies, the concentration-response curve for 5-HT was performed in the presence of incremental concentrations of agomelatine, and Schild analyses were undertaken to yield pA2 values (Arunlakshana and Schild, 1956). Influence upon h5-HT2C and h5-HT2B Receptor-Mediated [3H]Phosphatidylinositol (PI) Depletion. Via Gq/11, 5-HT2C receptors couple to phospholipase C (PLC), activation of which generates cytosolic inositol phosphates by the conversion of membrane-bound PIs, the principle substrate of PLC. Thus, using a model of [3H]PI depletion (Cussac et al., 2002b), we evaluated the influence of agomelatine upon the activity of PLC. Phospholipase C activity was monitored as described previously (Cussac et al., 2002b) by measuring the drug-induced decrease of [3H]PI levels in transfected CHO membranes. Drug efficacies were expressed relative to that of a maximally effective concentration of 5-HT (1 μM, defined as 100%). For antagonist studies, concentration-response curves of agomelatine (and melatonin) against 5-HT were analyzed as described above to yield KB values. In an additional antagonist study of h5-HT2C receptors, the concentration-response curve for 5-HT was performed in the presence of incremental concentrations of agomelatine, and Schild analyses were performed to yield pA2 values. Antagonist Properties at 5-HT2C Receptors in Vivo: Blockade of Ro60,0175- and Ro60,0332-Induced Penile Erections. Among several in vivo responses attributed to 5-HT2C receptors, the induction of penile erections is particularly well defined (Millan et al., 1997; Bös et al., 1998). Accordingly, to confirm the actions of agomelatine at 5-HT2C receptors in vivo, we examined the influence of agomelatine upon their induction by the high-efficacy 5-HT2C ligands Ro60,0175 and Ro60,0332 (Bös et al., 1998; Cussac et al., 2002a,b). As described previously (Millan et al., 1997), rats were individually placed in transparent Plexiglas observation cages immediately after drug or vehicle administration. Thirty minutes later, the animals received Ro60,0175 (1.25 mg/kg s.c.) or Ro60,0332 (2.5 mg/kg s.c.), and penile erections were measured over a 30-min observation period. Influence upon Dialysate Levels of Monoamines in the FCX, Nucleus Accumbens, and Striatum of Freely Moving Rats. Finally, we used a combined dialysis and electrophysiological approach (Gobert et al., 2000) for characterization of the influence of agomelatine upon the activity of frontocortical dopaminergic and adrenergic pathways. The protocol used for quantification of DA, NA, and 5-HT levels in single dialysate samples of FCX, nucleus accumbens, and striatum of freely moving rats has been detailed elsewhere (Gobert et al., 2000). Guide cannulae were implanted in rats under pentobarbital anesthesia (60 mg/kg i.p.) at the following coordinates: for FCX, AP, +2.2 from bregma; L, ± 0.6; and H, -0.2 from dura; for nucleus accumbens, AP, +0.8 from bregma; L, +0.6; and H, -4.5 from dura; and for striatum, AP, +0.5 from bregma; L, -2.8; and H, -3.0 from dura. The nucleus accumbens and striatum were examined (“dual probe”) simultaneously. All dialysis experiments were performed 5 days after placement of guide cannulae. A cuprophane CMA/11 probe (4 mm in length for the FCX and striatum, 2 mm in length for the nucleus accumbens; and, in each case, 0.24 mm of outer diameter) was lowered into position and perfused at 1 μl/min with a phosphate-buffered solution of 147.2 mM NaCl, 4 mM KCl, and 2.3 mM CaCl2 (pH 7.3). Two hours after implantation, samples (20 μl) were taken every 20 min, and after three basal samples, agomelatine (2.5-80.0 mg/kg i.p. ), melatonin (40.0 mg/kg i.p. ), or vehicle was injected, and sampling pursued for 3 h. In the antagonist study, S22153 (a selective melatonin antagonist) was injected (20.0 mg/kg i.p.) 20 min before agomelatine (40.0 mg/kg i.p.). The influence of drugs and vehicle was expressed relative to basal values (defined as 100%). The assay sensitivity was approximately 0.1-0.2 pg/sample for DA, NA, and 5-HT in each case. Modulation of the Electrical Activity of Dopaminergic and Adrenergic Neurons in Anesthetized Rats. Techniques detailed previously (Gobert et al., 2000; Millan et al., 2000a) were used for determination of the influence of drugs upon the electrical activity of dopaminergic and adrenergic perikarya localized in the ventrotegmental area (VTA) and locus coeruleus (LC), respectively. Rats were anesthetized with chloral hydrate (400 mg/kg i.p.) and placed in a stereotaxic apparatus. A tungsten microelectrode was lowered into the VTA or LC. Coordinates were as follows: for VTA, AP, 5.5 from bregma; L, 0.7; H, -7/-8.5 from dura; and for LC, AP, -1.2 from zero; L, 1.2; and H, -5.5/-6.5 from the sinus surface. As in our previous studies (Gobert et al., 2000; Millan et al., 2000a), dopaminergic and adrenergic neurons were identified according to their waveforms, firing rhythms, and response to selective agonists at dopamine D2/D3 and α2-adrenoceptors, respectively (Aghajanian and Bunney, 1973; Aghajanian et al., 1977). Briefly, dopaminergic neurons in the VTA displayed triphasic potentials (+/-/+) of >3-ms duration with a notch on the ascending limb: they showed a firing rate of 2 to 8 Hz, primarily in bursts. Adrenergic neurons in the LC showed biphasic potentials (+/-) of >2-ms duration with a notched wave form on the final ascending limb and a constant, tonic firing rate of 0.5 to 3 Hz. Furthermore, in response to contralateral paw pinch, they revealed a brief acceleration of firing (burst) followed by a transient silent period. Baseline recording was undertaken for at least 5 min. One cell was recorded in each animal. The influence of agomelatine (1.0-16.0 mg/kg i.v.) compared with melatonin (16.0 mg/kg i.v.) and vehicle (1/10 ethanol + 4/10 polyethyleneglycol 400 + 5/10 sterile water, injected i.v. in a volume of 0.5 ml/kg) upon firing rate was evaluated by administration in cumulative doses at intervals of 2 to 3 min. For antagonist studies with the 5-HT2C agonist Ro60,0175 (1.0 mg/kg i.v. ), agomelatine (4.0 mg/kg i.v.) and melatonin (4.0 mg/kg i.v.) were administered 2 to 3 min after its administration. After completion of studies of the VTA and LC, the D2/D3 agonist apomorphine (0.031 mg/kg i.v.) or the α2-adrenoceptor agonist clonidine (0.01 mg/kg i.v.) was injected to further confirm the identity of dopaminergic and adrenergic neurons, respectively. Drugs. With the exception of electrophysiological studies (see above), agomelatine, melatonin, and S22153 were administered i.p. as suspensions (in a few drops of Tween 80) in distilled water. Apomorphine and clonidine were injected i.v., and Ro60,0175 and Ro60,0332 were administered s.c. They were dissolved in sterile water plus a few drops of lactic acid and the pH adjusted with NaOH to as close to neutrality as possible (pH > 5.0). Drugs injected i.p. and s.c. were given in a volume of 1 ml/kg body weight. Doses refer to the base. Drug salts, structures, and sources were as follows: apomorphine HCl, clonidine HCl, and melatonin base were obtained from Sigma (St. Quentin-Fallavier, France) and agomelatine base, N-[2-(5-ethyl-benzo[b]thien-3-yl)ethyl] acetamide (S22153 base), (S)-2-(6-chloro-5-fluoroindol-1-yl)-1-methylethylamine (Ro60,0175 fumarate), and 1-methyl-2-(5,8,8-trimethyl-8H-3-aza-cyclopenta[a]inden-3-yl) ethylamine (Ro60,0332 fumarate) were synthesized by Servier (Croissy/Seine, France) chemists. Data Analysis and Statistics. Dose-response curves from in vivo studies were analyzed by analysis of variance (ANOVA) followed, as appropriate, by Dunnett's test or Newman-Keuls test. Single-dose comparisons were analyzed using Student's two-tailed t test. Binding Profile of Agomelatine and Melatonin (Table 1). Agomelatine monophasically displaced the binding of [3H]mesulergine to h5-HT2C receptors, whereas melatonin exerted little influence over a similar range of concentrations. 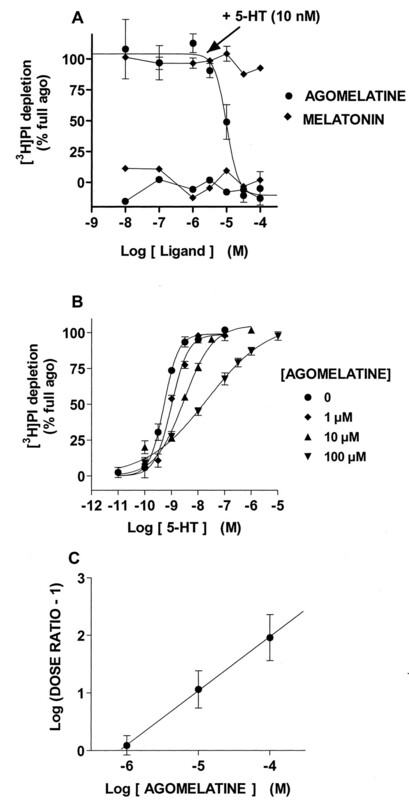 Similarly, agomelatine displayed higher affinity for native, porcine 5-HT2C receptors than melatonin. At h5-HT2B receptors, agomelatine also more potently displaced the binding of [3H]mesulergine than melatonin. The affinities of agomelatine and melatonin were comparatively low for both h5-HT2A and native, rat 5-HT2A receptors. Agomelatine and melatonin displayed negligible affinities for native, rat 5-HT1A receptors (pKi values < 5.0) and low affinities for cloned, h5-HT1A receptors (pKi values of 5.25 and 5.31, respectively). Using standard binding protocols, moreover, agomelatine failed to significantly bind to all other 5-HT receptors examined (h5-HT1B; h5-HT1D; cloned, murine 5-HT3; h5-HT4; h5-HT5A; h5-HT6; and h5-HT7): pKi values in each case of <5.0 with <10% displacement of radioligand at a concentration of agomelatine of 10 μM (not shown). Likewise, agomelatine showed negligible affinity for cloned, human and native, rat 5-HT, NA, and DA transporters: pKi values in each case of <5.0 with <10% displacement of radioligand at a concentration of agomelatine of 10 μM (not shown). Data are means ± S.E.M. of pKi values derived from at least three independent determinations, each of which was performed in triplicate. Antagonist Properties of Agomelatine and Melatonin at h5-HT2C Receptors: SPA Analysis (Figs. 1 and 2; Table 2). Agomelatine and melatonin did not activate Gq/11 and Gi3 proteins when tested alone. Although melatonin failed to block stimulation of Gq/11 and Gi3 proteins by 5-HT, agomelatine concentration dependently and completely blocked 5-HT-induced Gq/11 and Gi3 protein activation with pKB values of 6.0 and 5.9, respectively. In the presence of incremental concentrations of agomelatine, the concentration-response curves for 5-HT-induced Gq/11 and Gi3 activation were displaced in parallel to the right without a loss of maximal effect. These data generated linear Schild plots with slopes not significantly different from unity (0.96 for Gq/11 and 0.94 for Gi3), yielding pA2 values of 6.0 for both Gq/11 and Gi3. Antagonist properties of agomelatine compared with melatonin at cloned, human h5-HT2C receptors as determined in a scintillation proximity assay of the activation of Gq/11. A, concentration-dependent blockade of the induction of [35S]GTPγS binding by 10 nM 5-HT. B, displacement to the right of the concentration-response curve for 5-HT in the presence of incremental concentrations of agomelatine. C, Schild transformation of the data in B. The curves shown are from representative experiments, each of which was performed in triplicate. For each concentration, values shown are the means ± S.E.M. of the triplicates. Antagonist properties of agomelatine compared with melatonin at cloned, human h5-HT2C receptors as determined in a scintillation proximity assay of the activation of Gi3. A, concentration-dependent blockade of the induction of [35S]GTPγS binding by 100 nM 5-HT. B, displacement to the right of the concentration-response curve for 5-HT in the presence of incremental concentrations of agomelatine. C, Schild transformation of the data in B. The curves shown are from representative experiments, each of which was performed in triplicate. For each concentration, values shown are the means ± S.E.M. of the triplicates. Antagonist properties of agomelatine compared to melatonin at h5-HT2C and h5-HT2B receptors Data are means ± S.E.M. derived from at least three independent determinations, each of which was performed in triplicate. Antagonist Properties of Agomelatine and Melatonin at h5-HT2C Receptors: [3H]PI Depletion (Fig. 3; Table 2). Neither agomelatine nor melatonin led to [3H]PI depletion when tested alone. However, although melatonin did not block the action of 10 nM 5-HT, agomelatine concentration dependently and completely blocked 5-HT-induced [3H]PI depletion with a pKB value of 6.1. In the presence of incremental concentrations of agomelatine, the concentration response for 5-HT was displaced in parallel to the right with no loss of maximal effect. Although the curve tended to flatten at the highest concentration of agomelatine, the slope derived from Schild analysis was not different to unity (0.94). Furthermore, the pA2 value of 6.1 corresponded well to the pKB value. Antagonist properties of agomelatine compared with melatonin at cloned, human h5-HT2C receptors as determined in a [3H]PI depletion assay of the activation of phospholipase C. A, concentration-dependent blockade of 10 nM 5-HT-induced [3H]PI depletion. B, displacement to the right of the concentration-response curve for 5-HT in the presence of incremental concentrations of agomelatine. C, Schild transformation of the data in B. The curves shown are from representative experiments, each of which was performed in triplicate. For each concentration, values shown are the means ± S.E.M. of the triplicates. 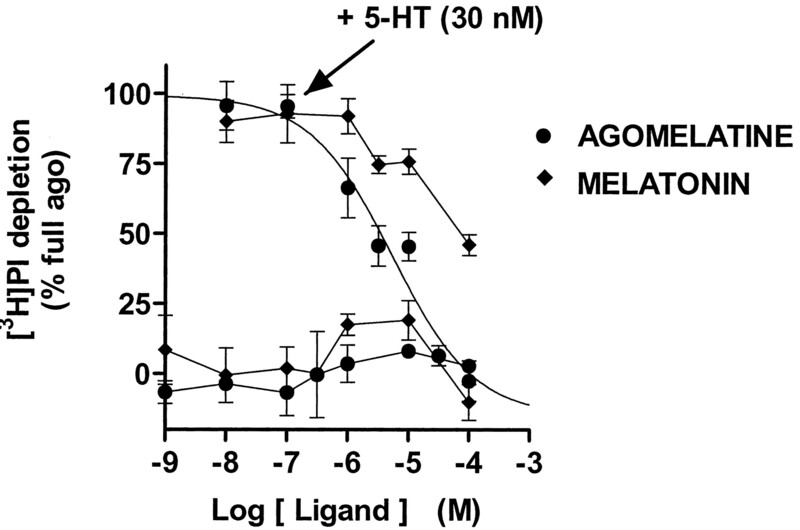 Antagonist Properties of Agomelatine and Melatonin at h5-HT2B Receptors: [3H]PI Depletion (Fig. 4; Table 2). Agomelatine failed to elicit [3H]PI depletion alone and concentration dependently blocked the action of 5-HT with a pKB value of 6.6 corresponding well to its pKi value (6.6) at these sites. Melatonin likewise did not enhance [3H]PI depletion and partially attenuated the action of 5-HT, although only ∼50% of inhibition was acquired even at a concentration of 100 μM. It was not possible, for reasons of solubility, to evaluate higher concentrations of melatonin. Antagonist properties of agomelatine compared with melatonin at cloned, human h5-HT2B receptors as determined in a [3H]PI depletion assay of the activation of phospholipase C. Concentration-dependent blockade of 30 nM 5-HT-induced [3H]PI depletion. The curves shown are from representative experiments, each of which was performed in triplicate. For each concentration, values shown are the means ± S.E.M. of the triplicates. Antagonist Properties of Agomelatine and Melatonin: Inhibition of Penile Erections Evoked by 5-HT2C Agonists (Fig. 5). In agreement with our previous investigation (Millan et al., 1997), the high-efficacy 5-HT2C agonist Ro60,0175 (Bös et al., 1998; Cussac et al., 2002a,2002b) elicited a marked penile erection response in rats (0.16-2.5 mg/kg s.c.) Agomelatine, which did not itself elicit penile erection (0.63 and 40.0 mg/kg i.p.) concentration dependently (2.5-80.0 mg/kg i.p.) blocked the action of Ro60,0175 (2.5 mg/kg s.c.). A further high-efficacy 5-HT2C agonist of greater selectivity, Ro60,0332 (Bös et al., 1998; Cussac et al., 2002a,b), similarly evoked penile erections (0.16-2.5 mg/kg s.c.) and its actions (2.5 mg/kg s.c.) were also dose dependently (2.5-40.0 mg/kg i.p.) abolished by agomelatine. Melatonin (10.0 and 40.0 mg/kg i.p.) neither evoked penile erections (10.0 and 40.0 mg/kg i.p.) nor significantly interfered (2.5-40.0 mg/kg i.p.) with their induction by Ro60,0175 and Ro60,0332. ANOVA is as follows. For induction of penile erections, Ro60,0175, F(4,42) = 15.4, P < 0.001; Ro60,0332, F(4,39) = 10.4, P < 0.001; agomelatine, F(2,21) = 0.5, P > 0.05; and melatonin, F(2.21) = 1.0, P > 0.05. For blockade of the actions of Ro60,0175, agomelatine, F(4,43) = 21.1, P < 0.001; and melatonin, F(2,21) = 1.0, P > 0.05. For blockade of the actions of Ro60,0332, agomelatine, F(4,56) = 4.5, P < 0.01 and melatonin, F(4,43) = 0.7, P > 0.05. Antagonist properties of agomelatine compared with melatonin at 5-HT2C receptors in vivo as determined by blockade of the induction of penile erections by the 5-HT2C agonists Ro60,0175 and Ro60,0332. A, induction of penile erections by Ro60,0175 (0.16-2.5 mg/kg s.c.) and Ro60,0332 (0.16-10.0 mg/kg s.c.) compared with agomelatine (0.63 and 40.0 mg/kg i.p.) and melatonin (10.0 mg/kg i.p.). B, blockade of the action of Ro60,0175 (1.25 mg/kg s.c.) by agomelatine (2.5-80.0 mg/kg i.p.). C, blockade of the action of Ro60,0332 (2.5 mg/kg s.c.) by agomelatine (2.5-40.0 mg/kg i.p.). Closed symbols are for drug treatment and open symbols for vehicle (VEH) controls. Data are means ± S.E.M. n ≥ 8/value. Asterisks indicate significance of differences to respective vehicle values in Dunnett's test. *, P < 0.05. 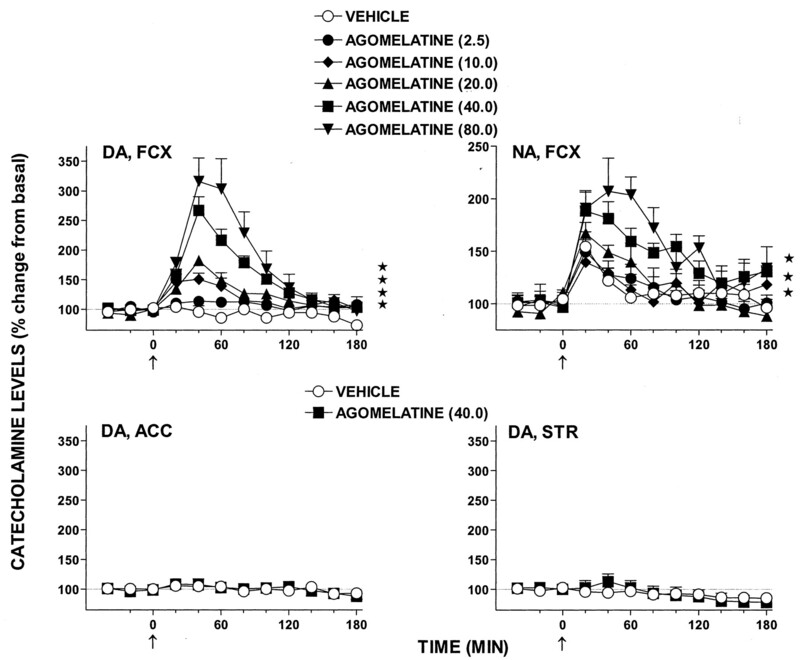 Influence of Agomelatine and Melatonin upon Extracellular Levels of DA and NA in the FCX Compared with the Nucleus Accumbens and Striatum of Freely Moving Rats (Fig. 6). Administration of vehicle elicited a transient elevation in FCX levels of NA (but not DA), which has previously been shown to reflect handling and manipulation (Millan et al., 2000b). In comparison, agomelatine (2.5-80.0 mg/kg i.p.) elicited a marked, sustained, and dose-dependent elevation in extracellular levels of both DA and NA in the FCX. Quantified in the same samples, there was no alteration in levels of 5-HT (not shown). ANOVA is as follows. DA, agomelatine (2.5), F(1,9) = 1.1, P > 0.05; agomelatine (10.0), F(1,10) = 7.8, P < 0.05; agomelatine (20.0), F(1,11) = 27.8, P < 0.01; agomelatine (40.0), F(1,10) = 37.2, P < 0.01; and agomelatine (80.0), F(1,10) = 15.1, P < 0.01. NA, agomelatine (2.5), F(1,9) = 0.1, P > 0.05; agomelatine (10.0), F(1,10) = 0.3, P > 0.05; agomelatine (20.0), F(1,11) = 4.5, P < 0.05; agomelatine (40.0), F(1,10) = 13.0, P < 0.01; and agomelatine (80.0), F(1,10) = 13.8, P < 0.01. Melatonin (40.0 mg/kg i.p., n = 7) did not, in contrast to agomelatine, significantly modify levels of DA, NA (not shown), or 5-HT. Area under the curve analysis is as follows. 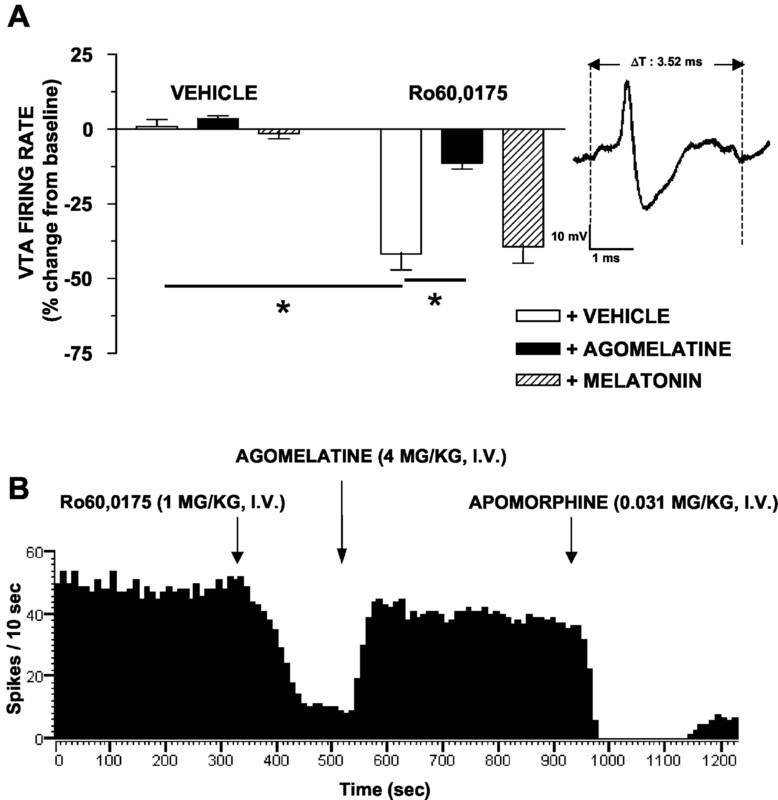 For DA, vehicle = 106.4 ± 5.0% versus melatonin = 118.3 ± 4.8% (P > 0.05) and for NA, vehicle = 118.6 ± 5.1% versus melatonin = 135.9 ± 6.5% (P > 0.05). Administered at a dose (40.0 mg/kg i.p., n = 6) that elicited a pronounced increase in extracellular levels of DA in the FCX, agomelatine did not significantly modify dialysis levels of DA in terminal regions of subcortical projections, the nucleus accumbens, and the striatum. ANOVA is as follows. Nucleus accumbens, agomelatine (40.0), F(1,10) = 0.4, P > 0.05 and striatum, DA: agomelatine (40.0), F(1,10) = 0.1, P > 0.05. Serotonin levels were also unaffected by agomelatine in these structures (not shown). Melatonin (40.0 mg/kg i.p., n = 7) likewise did not affect levels of DA or 5-HT (not shown) in the nucleus accumbens and striatum. Area under the curve analysis is as follows (for DA): for the nucleus accumbens, vehicle = 97.5 ± 2.4% versus melatonin = 91.7 ± 2.0% (P > 0.05) and for the striatum, vehicle = 91.6 ± 4.1% versus melatonin = 79.8 ± 3.1% (P > 0.05). Lack of Influence of the Selective Melatonin Antagonist S22153 upon the Increase in Extracellular Levels of NA and DA Elicited by Agomelatine in the FCX of Freely Moving Rats (Fig. 7). Administration of the selective melatonin (MT1/MT2) antagonist S22153 (Weibel et al., 1999) at a dose of 20.0 mg/kg i.p. did not itself influence levels of DA or NA in FCX dialysates. In its presence, the facilitatory influence of agomelatine (40.0 mg/kg i.p.) upon the release of DA and NA was not modified. ANOVA is as follows. DA: influence of agomelatine: F(1,9) = 78.1, P < 0.01; influence of S22153, F(1,10) = 0.6, P > 0.05 and interaction, F(1,8) = 0.1, P > 0.05. NA: influence of agomelatine, F(1,9) = 19.8, P < 0.01; influence of S22153, F(1,9) = 0.4, P > 0.05 and interaction, F(1,8) = 0.1, P > 0.05. S22153 also failed to affect levels of 5-HT, either alone or when coadministered with agomelatine (not shown). Influence of agomelatine upon extracellular levels of NA and DA in the FCX compared with extracellular levels of DA in the nucleus accumbens (ACC) and striatum (STR) of freely moving rats. Data are means ± S.E.M. of DA and NA levels expressed relative to basal, pretreatment values (defined as 100%). These were 1.1 ± 0.1, 8.3 ± 1.2, and 13.0 ± 1.5 pg/20 μl of dialysate for DA in the FCX, nucleus accumbens, and striatum, respectively, and 1.49 ± 0.05 pg/20 μl of dialysate for NE in the FCX. n ≥ 5/value. All drug doses are in milligrams per kilogram i.p. Asterisks indicate significance of drug versus vehicle values in Dunnett's test. *, P < 0.05. Lack of influence of the selective melatonin antagonist S22153 upon the increase in extracellular levels of DA and NA elicited by agomelatine in the frontal cortex of freely moving rats. Data are means ± S.E.M. n ≥ 5/value. All drug doses are in milligrams per kilogram i.p. 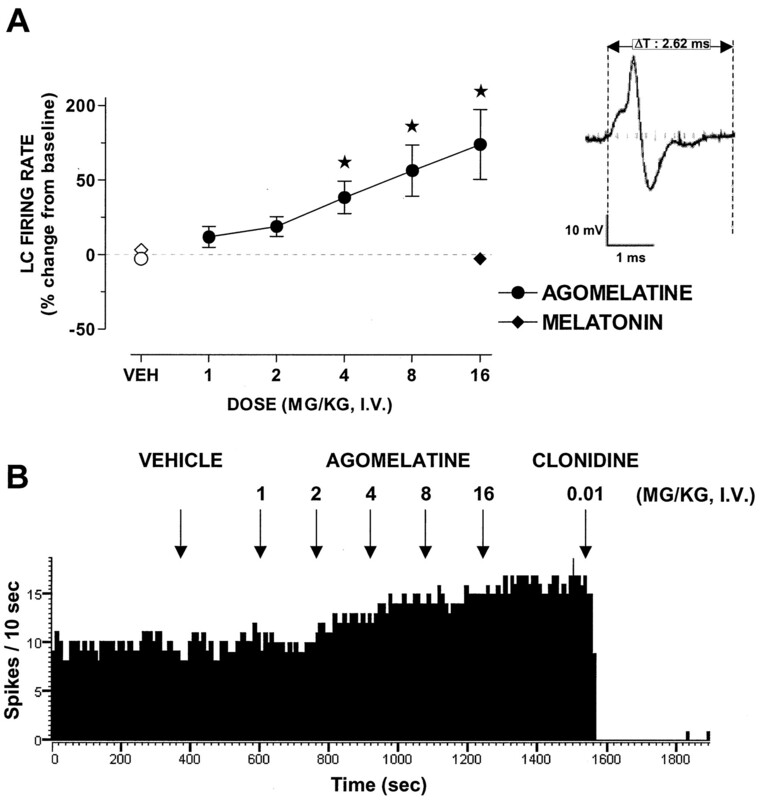 Influence of Agomelatine and Melatonin upon the Electrical Activity of Adrenergic Neurons (Fig. 8). In anesthetized rats, as originally characterized elsewhere (Aghajanian et al., 1977), and in line with our previous studies (Gobert et al., 2000; Millan et al., 2000a), adrenergic neurons in the LC could be recognized by their distinctive notched and biphasic wave form (>2 ms); their slow tonic firing rate; their transient acceleration upon “pinching” the contralateral hind paw; and, after evaluation of the test drug, the complete inhibition of their firing rate by administration of the α2-adrenoceptor agonist clonidine. A representative spike tracing is presented in Fig. 8. Administered by the i.v. route, agomelatine (1.0-16.0 mg/kg i.v.) elicited a dose-dependent and pronounced increase in the firing rate of adrenergic perikarya. ANOVA is as follows: F(5,29) = 4.15, P < 0.01. In all neurons responsive to agomelatine, subsequent administration of clonidine (0.01 mg/kg i.v.) abolished their electrical activity. In contrast to agomelatine, melatonin (16.0 mg/kg i.v.) did not significantly modify the electrical activity of adrenergic cell bodies. Influence of agomelatine compared with melatonin upon the electrical activity of adrenergic perikarya in the locus coeruleus. 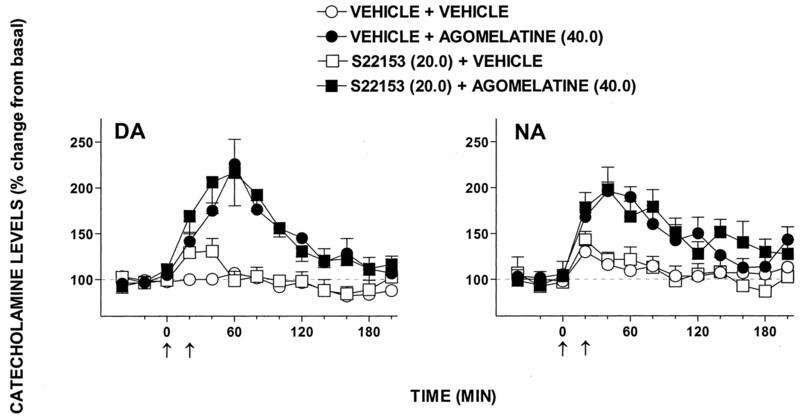 A, dose-dependent influence of agomelatine upon firing rate. B, representative spike from a dopaminergic neuron. C, influence of agomelatine followed by the α2-adrenoceptor agonist clonidine upon the electrical discharge of a representative neuron. Top, data are means ± S.E.M. n ≥ 5/value. Closed symbols are for drug treatment and open symbols for vehicle (VEH) controls. All drug doses are in milligrams per kilogram i.v. Asterisks indicate significance of differences to respective vehicle values in Newman-Keuls test (paired data). *, P < 0.05. For melatonin (Student's two-tailed t test), P > 0.05. Influence of Agomelatine and Melatonin upon the Electrical Activity of Dopaminergic Neurons (Fig. 9). In anesthetized rats, as originally characterized by others (Aghajanian and Bunney, 1973), and in line with our previous studies (Gobert et al., 2000; Millan et al., 2000a), dopaminergic neurons in the VTA were identified by their characteristic, long-lasting (>3-ms) triphasic waveform; their primarily burst firing mode; and, after evaluation of the test drug, inhibition of their activity by the D2/D3 dopamine receptor agonist apomorphine. A representative spike tracing is presented in Fig. 9. In contrast to adrenergic perikarya, agomelatine (1.0-16.0 mg/kg i.p.) did not significantly modify the firing rate of dopaminergic neurons; furthermore, it did not change the ratio of regular to burst firing (not shown). The 5-HT2C agonist Ro60,0175 (1 mg/kg i.v.) markedly reduced the firing rate of dopaminergic perikarya, corroborating our previous study (Gobert et al., 2000). This inhibitory influence of Ro60,0175 was reversed by agomelatine (4 mg/kg i.v.). ANOVA is as follows: influence of Ro60,0175, F(1,22) = 75.6, P < 0.001; influence of agomelatine, F(1,22) = 15.8, P < 0.01; and influence of melatonin, F(1,22) = 0.2, P > 0.05. Melatonin (4 mg/kg i.v.) neither affected the basal firing rate of dopaminergic neurons nor modified their response to Ro60,0175. The electrical activity of neurons was, in all cases, abolished by apomorphine (0.031 mg/kg i.v.). Influence of agomelatine compared with melatonin upon the electrical activity of dopaminergic perikarya in the ventral tegmental area, and blockade by agomelatine of the action of Ro60,0175. A, lack of influence of agomelatine and melatonin upon basal firing rate compared with Ro60,0175 and reversal of the inhibitory influence of Ro60,0175 by agomelatine compared with melatonin. B, representative spike from an adrenergic neuron. C, representative neuron showing the blockade by agomelatine of the action of Ro60,0175 followed by inhibition of firing with the dopaminergic agonist apomorphine. For A, data are means ± S.E.M. n ≥ 5/value. All drug doses are in milligrams per kilogram i.v. Asterisks indicate significance of differences in Dunnett's test. *, P < 0.05. Interaction of Agomelatine with 5-HT2 Receptors versus Other Classes of 5-HT Receptor. Agomelatine could be distinguished from melatonin by its interaction with 5-HT2C and 5-HT2B receptors, although its affinity for 5-HT2A and other serotonergic 5-HT sites was low. Notably, agomelatine also showed low affinity for h5-HT1A receptors and, even at 10 μM, neither stimulated nor blocked h5-HT1A sites in a GTPγS binding assay (D. Cussac, unpublished observation). Correspondingly, although raphe-localized serotonergic neurons bear 5-HT1A autoreceptors, agomelatine influenced neither their firing rate nor dialysate levels of 5-HT (vide infra). Antagonist Actions of Agomelatine at h5-HT2C Receptors in Vitro. 5-HT induces [35S]GTPγS binding to both Gq/11 and Gi3 via h5-HT2C receptors, actions blocked by the selective 5-HT2C antagonist SB242,084 (Cussac et al., 2002a). By analogy, agomelatine abolished stimulation of Gq/11 and Gi3 by 5-HT, whereas melatonin was inactive. The dextral displacement of the concentration-response curve for 5-HT by agomelatine indicates that it behaves as a competitive antagonist. Underpinning this contention, for both Gq/11 and Gi3, pA2 values corresponded well to pKB and pKi values. 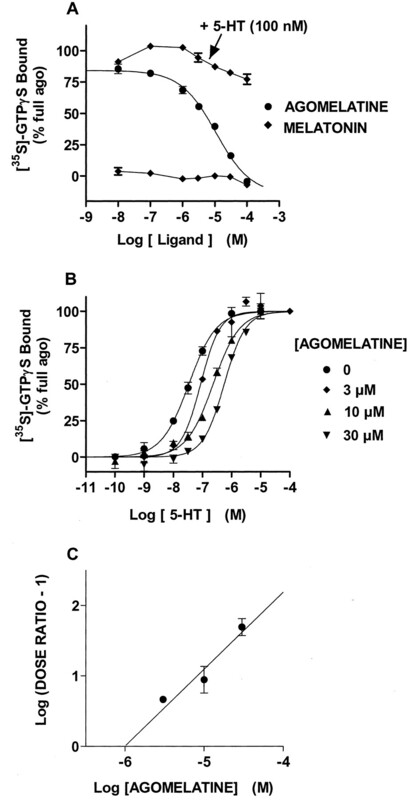 That agomelatine acts as a pure antagonist at two different G protein subtypes coupled to h5-HT2C receptors is important inasmuch as 1) they may control different functions in vivo, and 2) certain 5-HT2C receptor ligands differentially influence G protein subtypes (Berg et al., 1998; Cussac et al., 2002a). Agomelatine similarly behaved as a competitive antagonist in blocking 5-HT-elicited [3H]PI depletion, presumably reflecting activation of PLC by Gq/11 (Gerhardt and Herrekuiken, 1997). The lack of intrinsic actions of agomelatine underscores its antagonist profile inasmuch as (reflecting amplification between G proteins and PLC) [3H]PI depletion is a particularly sensitive measure of efficacy (Gerhardt and Herrekuiken, 1997; Cussac et al., 2002b). These studies were undertaken with the “VSV” (edited) isoform of h5-HT2C receptors, which is broadly distributed in cerebral tissues (Herrick-Davis et al., 1999). Compared with the VSV isoform, wild-type (“INI”) 5-HT2C receptors display constitutive activity: “neutral” antagonists behave as inverse agonists (Berg et al., 1998; Herrick-Davis et al., 1999). Although the pathophysiological significance of constitutive activity remains unclear, potential inverse agonist actions of agomelatine at 5-HT2C receptors would be of interest to examine. Antagonist Properties of Agomelatine at 5-HT2C Receptors in Vivo. The 5-HT2C receptor agonists Ro60,0175 and Ro60,0332 elicit penile erections in rats, a response abolished by antagonists at 5-HT2C, but not 5-HT2A or 5-HT2B, receptors (Millan et al., 1997; Bös et al., 1998). Blockade of their actions by agomelatine indicates that, in distinction to melatonin, it behaves as an antagonist at native 5-HT2C receptors in vivo, underpinning cellular studies. The relevance of antagonist actions in this model to sexual behavior remains unclear. Antidepressants possessing antagonist properties at 5-HT2C receptors, such as mirtazapine, elicit fewer problems of diminished libido than drugs, which increase extracellular levels of 5-HT. Indeed, the suppressive influence of 5-HT uptake inhibitors upon sexual behavior involves activation of 5-HT2C receptors (Rosen et al., 1999; Gelenberg et al., 2000). The affinity of agomelatine at 5-HT2C receptors is substantially (>100-fold) lower than at MT1 and MT2 receptors. Correspondingly, in comparison with chronobiotic paradigms reflecting engagement of melatonin sites (Van Reeth et al., 2001), agomelatine exerts actions at 5-HT2C receptors (this study; A. Dekeyne, unpublished observations) over a higher dose range. In fact, the degree of dose separation (∼10-20-fold) is less pronounced than expected from its differential affinities. This may reflect the difficulty of comparing potencies between agonist actions at one site (MT) and antagonist actions at another (5-HT2C). Furthermore, agomelatine may be a more potent antagonist at 5-HT2C isoforms other than VSV (vide supra) (Berg et al., 1998). In any case, these in vivo studies show that the modest affinity of agomelatine is sufficient to block cerebral 5-HT2C receptors. In support of this assertion, plasma levels of agomelatine (12.8 μM at 50.0 mg/kg i.p., 1 h after administration) are superior to its affinity (1 μM) for these sites. The role of 5-HT2C sites in clinical actions of agomelatine (Loôo et al., 2002) remains to be clarified. Antagonist Actions of Agomelatine at h5-HT2B Receptors in Vitro. The binding and coupling profiles of h5-HT2B and h5-HT2C receptors are similar (Gerhardt and Heerikhuizen, 1997; Cussac et al., 2002b) and agomelatine also blocked 5-HT-induced [3H]PI depletion at h5-HT2B sites. 5-HT2B receptors are poorly represented in the central nervous system, wherein their functional significance remains obscure (Duxon et al., 1997). Indeed, studies specifically examining their potential role in the induction of penile erections and modulation of monoaminergic transmission have yielded negative findings (Millan et al., 1997, 2000b; Bös et al., 1998; Di Giovanni et al., 1999; Gobert et al., 2000; Di Matteo et al., 2001). Although their engagement reduces anxiety and elicits hyperphagia in rats (Kennett et al., 1998), like selective 5-HT2B receptor antagonists, agomelatine shows neither anxiogenic nor appetite-suppressant properties (A. Dekeyne, unpublished observations). Furthermore, although stimulation of 5-HT2B sites exerts actions in peripheral tissues, in particular in development, there is no evidence for functional effects of antagonists at these sites (Nebigil and Maroteaux, 2001). Lack of Antagonist Actions of Agomelatine at 5-HT2A Receptors. Although the low affinity of agomelatine for h5-HT2A sites precluded antagonist studies, it failed to trigger [3H]PI depletion at high concentrations (10-4 M). Furthermore, agomelatine (80.0 mg/kg s.c.) neither increased levels of corticosterone nor modified their elevation by 5-HT2A agonists (J.-M. Rivet and M. J. Millan, unpublished observations). Thus, agomelatine does not exert actions via 5-HT2A receptors. Extending a report of Dugovic et al. (1989) at rat 5-HT2A sites, melatonin had low affinity for h5-HT2A receptors. Modulation by Agomelatine of Frontocortical Dopaminergic and Adrenergic Transmission. Agomelatine elevated extracellular levels of NA and DA in FCX, whereas, in line with its low affinity for 5-HT1A sites, levels of 5-HT were unaffected. Accordingly, although activation of 5-HT1A auto-receptors disinhibits frontocortical catecholaminergic transmission (Millan et al., 2000), this mechanism cannot be involved in the elevation in FCX levels of NA and DA by agomelatine. Furthermore, this action of agomelatine was insensitive to the melatonin (MT1/MT2) antagonist S22153 at a dose that abolishes its in vivo actions at melatoninergic receptors (Ying et al., 1998; Weibel et al., 1999). The inability of melatonin to elevate levels of DA and NA in FCX also suggests that the agonist actions of agomelatine at melatoninergic receptors are not involved in its reinforcement of catecholaminergic input to the FCX (interestingly, melatonin inhibits DA release in the hypothalamus; Zisapel, 2002). On the contrary, several arguments support a role of 5-HT2C receptor blockade in the induction of frontocortical release of NA and DA by agomelatine. First, the magnitude of its effect was comparable to that of the 5-HT2C antagonists SB206,553 and SB242,084 (Gobert et al., 2000). Second, the active dose range for agomelatine corresponds well to that which blocks induction of penile erections by Ro60,0175 and Ro60,0332. Third, although agomelatine antagonizes 5-HT2B receptors, they do not modulate monoaminergic transmission (Millan et al., 2000b; Di Matteo et al., 2001). Fourth, agomelatine enhanced the spontaneous electrical activity of LC-localized adrenergic perikarya that are subject to tonic inhibition by 5-HT2C receptors acting indirectly via (excitation of) GABAergic interneurons (Gobert et al., 2000; Millan et al., 2000b). Thus, as for other 5-HT2C antagonists, agomelatine enhances ascending adrenergic transmission at least partially via actions at cell bodies. Excitation of GABAergic interneurons also intervenes in the inhibitory influence of 5-HT2C receptors upon dopaminergic perikarya (Di Giovanni et al., 1999; Millan et al., 2000b), and correspondingly, agomelatine abolished their inhibition by Ro60,0175. However, agomelatine neither increased the firing rate of dopaminergic neurons nor transformed their firing pattern into a bursting mode. By analogy, although SB206,533 facilitates electrical activity of VTA neurons, its influence is modest, whereas the selective 5-HT2C antagonist SB242,084, like agomelatine, does not excite VTA-dopaminergic perikarya (Di Giovanni et al., 1999; Millan et al., 2000b). Thus, tonic control of dopaminergic cell bodies is less pronounced than for their adrenergic counterparts, and the principle locus of action of agomelatine in enhancing frontocortical dopaminergic transmission may be the FCX itself, probably at local GABAergic interneurons targeting dopaminergic terminals. An alternative explanation for the agomelatine-induced elevation in FCX levels of DA in the absence of changes in firing rate of VTA-dopaminergic neurons may be that it is secondary to the elevation in NA levels (Yamamoto and Novotney, 1998; Millan et al., 2000b). Thus, DA clearance in the FCX is partially effected by “NA transporters” on adrenergic terminals that can be saturated by high extracellular levels of NA. Dopaminergic and adrenergic mechanisms in the FCX modulate cognitive-attentional performance, mood, and motor behavior (Arnsten, 1997; Millan et al., 2000b). These functions are profoundly perturbed in depressive states in which a hypofrontality involving deficient catecholaminergic input to the FCX has been implicated (Millan et al., 2000b). Indeed, all clinically effective antidepressant agents enhance extracellular levels of DA and NA in the FCX of freely moving rats (Millan et al., 2000b). Thus, a reinforcement of FCX release of NA and DA by agomelatine may improve depressive states. Nevertheless, for agomelatine and other agents, it remains to be established whether an increase in FCX release of DA and NA is sufficient for therapeutic efficacy. Thus, caution should be exercised in relating this action of agomelatine to its effects in behavioral models of potential antidepressant properties in rodents (Bourin et al., 2002; Papp et al., 2003) and to its clinical actions in patients with major depression (Loôo et al., 2002). Lack of Influence of Agomelatine upon Subcortical DA Release. Although the significance of 5-HT2C receptors in the control of mesolimbic compared with nigrostriatal dopaminergic transmission remains controversial, there is a consensus that their tonic inhibition by 5-HT2C receptors is less pronounced than for their frontocortical counterparts (Gobert et al., 2000; Millan et al., 2000b; De Deurwaerdère and Spampinato, 2001; Di Matteo et al., 2001). Indeed, mimicking SB206,553 and SB242,084 (Gobert et al., 2000), agomelatine did not modify dialysis levels of DA in the nucleus accumbens and striatum. Although behavioral studies suggest that melatonin interacts with dopaminergic mechanisms controlling motor behavior in the nucleus accumbens and striatum, there is no evidence that it modulates DA release in these structures (Durlach-Misteli and Van Ree, 1992; Zisapel, 2002). Indeed, melatonin did not modify dialysis levels of DA in the nucleus accumbens and striatum. Functional Interactions between Melatonin and Serotonergic Transmission. Melatonin indirectly interferes with activity at 5-HT2A receptors (Dugovic et al., 1989; Eison et al., 1995), whereas 5-HT2A sites modulate both the secretion of melatonin and its behavioral effects in rats (Gaffori and Van Ree, 1985; Govitrapong et al., 1991). Most pertinently, 5-HT2C receptors are enriched in the suprachiasmatic nucleus (Sharma et al., 1997), a major locus of action of melatonin (Liu et al., 1997; Redman and Francis, 1998; Ying et al., 1998). Therein, 5-HT2C sites contribute to the influence of light upon neuronal rhythmicity and melatonin production (Kennaway and Moyer, 1998). Such interactions should be borne in mind in interpreting the functional profile of agomelatine. In distinction to melatonin, agomelatine behaves as an antagonist at native, cerebral, and cloned, human 5-HT2C receptors in both cellular and in vivo paradigms. Correspondingly, blockade of 5-HT2C receptors by agomelatine increases extracellular levels of DA and NA in FCX. It will be of interest to evaluate the contribution of the 5-HT2C antagonist properties of agomelatine, and the accompanying enhancement of frontocortical dopaminergic and adrenergic transmission, and its influence on mood. ABBREVIATIONS: NA, noradrenaline; MT, melatonin; 5-HT, 5-hydroxytryptamine (serotonin); DA, dopamine; FCX, frontal cortex; CHO, Chinese hamster ovary; SPA, scintillation proximity assay; [35S]GTPγS, guanosine-5′-O-(3-[35S]thio)-triphosphate; PI, phosphatidylinositol; PLC, phospholipase C; VTA, ventrotegmental area; LC, locus coeruleus; ANOVA, analysis of variance; SB242,084, 6-chloro-5-methyl-1-[6-(2-methylpyridin-3-yloxy)pyridin-3-ylcarbamoyl]indoline. Aghajanian GK and Bunney BS (1973) Central dopaminergic neurons: neurophysiological identification and response to drugs, in Frontiers of Catecholamine Research (Usdin E and Snyder SH eds) pp 643-648, Pergamon Press, New York. Aghajanian GK, Cedarbaum JM, and Wang RY (1977) Evidence for a norepinephrine-mediated collateral inhibition of locus coeruleus neurons. Brain Res 136: 570-577. Alberts GL, Pregenzer JF, Im WB, Zaworski PG, and Gill GS (1999) Agonist-induced GTPγ35S binding mediated by human 5-HT2C receptors expressed in human embryonic kidney 293 cells. Eur J Pharmacol 383: 311-319. Arnsten AFT (1997) Catecholamine regulation of the prefrontal cortex. J Psychopharmacol 11: 151-162. Arunlakshana O and Schild H (1956) Some quantitative uses of drug antagonists. Br J Pharmacol 14: 48-58. Berg KA, Maayani S, Goldfarb J, Scaramellini C, Leff P, and Clarke WP (1998) Effector pathway-dependent relative efficacy at serotonin type2A and 2C receptors: evidence for agonist-directed trafficking of receptor stimulus. Mol Pharmacol 54: 94-104. Borjigin J, Li X, and Snyder SH (1999) The pineal gland and melatonin: molecular and pharmacologic regulation. Annu Rev Pharmacol Toxicol 39: 53-65. Bourin M, Mocaër E, and Porsolt R (2002) Efficacy and behavioural profile of S20098 in the despair test after acute and repeated administration. Int J Neuropsychopharmacol 5: S1-S65. Bös MM, Jenck F, Moreau JL, Mutel V, Sleight AJ, Wichmann J, Andrews JS, Berendsen HHG, Broekkamp CLE, Ruigt GSF, et al. (1998) 5-HT2C receptor agonists: pharmacological characteristics and therapeutic potential. J Pharmacol Exp Ther 286: 913-924. Bristow LJ, O'Connor D, Watts R, Duxon MS, and Hutson PH (2000) Evidence for accelerated desensitisation of 5-HT2C receptors following combined treatment with fluoxetine and the 5-HT1A receptor antagonist, WAY100, 635, in the rat. Neuropsychopharmacology 39: 1222-1236. Cussac D, Newman-Tancredi A, Duqueyroix D, Pasteau V, and Millan MJ (2002a) Differential activation of Gq/11 and Gi3 proteins at 5-HT2C receptors revealed by antibody capture assays: influence of receptor reserve and relationship to agonist-directed trafficking. Mol Pharmacol 62: 578-589. Cussac D, Newman-Tancredi A, Quentric Y, Carpentier N, Poissonnet G, Parmentier J-G, Goldstein S, and Millan MJ (2002b) Characterization of phospholipase C activity at h5-HT2C compared with h5-HT2B receptors: influence of novel ligands upon membrane-bound levels of [3H]phosphatidylinositols. Naunyn-Schmiedeberg's Arch Pharmacol 365: 242-252. De Deurwaerdère P and Spampinato U (2001) The nigrostriatal dopamine system: a neglected target for 5-HT2C receptors. Trends Pharmacol Sci 22: 502-503. DeLapp NW, McKinzie JH, Sawyer BD, Vandergriff A, Falcone J, McClure D, and Felder CC (1999) Determination of [35S]guanosine-5′-O-(3-thio)triphosphate binding mediated by cholinergic muscarinic receptors in membranes from Chinese hamster ovary cells and rat striatum using an anti-G protein scintillation proximity assay. J Pharmacol Exp Ther 289: 946-955. Di Giovanni G, De Deurwaerdère P, Di Mascio M, Di Matteo V, Algeri S, Esposito E, and Spampinato U (1999) Selective blockade of serotonin2C/2B receptors enhances mesolimbic and mesocortical dopaminergic function: a combined in vivo electrophysiological and microdialysis study. Neuroscience 91: 587-597. Di Matteo V, De Blasi A, Di Giulio C, and Esposito E (2001) Role of 5-HT2C receptors in the control of central dopamine function. Trends Pharmacol Sci 22: 229-232. Dugovic C, Leysen JE, and Wauquier A (1989) Melatonin modulation of the sensitivity of 5-hydroxytryptamine-2-receptor-mediated sleep-wakefulness regulation in the rat. Neurosci Lett 104: 320-325. Durlach-Misteli C and Van Ree JM (1992) Dopamine and melatonin in the nucleus accumbens may be implicated in the mode of action of antidepressant drugs. Eur J Pharmacol 217: 15-21. Duxon MS, Flanigan TP, Reavley AC, Baxter GS, Blackburn TP, and Fone KCF (1997) Evidence for expression of the 5-hydroxytryptamine-2B receptor protein in the rat central nervous system. Neuroscience 76: 323-329. Eison AS, Freeman RP, Guss VB, Mullins UL, and Wright RN (1995) Melatonin agonists modulate 5-HT2A receptor-mediated neurotransmission: behavioral and biochemical studies in the rat. J Pharmacol Exp Ther 273: 304-308. Gaffori O and Van Ree JM (1985) Serotonin and antidepressant drugs antagonize melatonin-induced behavioural changes after injection into the nucleus accumbens of rats. Neuropharmacology 24: 237-244. Gelenberg AJ, Laukes C, McGahuey C, Okayli G, Moreno F, Zentner L, and Delgado P (2000) Mirtazapine substitution in SSRI-induced sexual dysfunction. J Clin Psychiatry 61: 356-360. Gerhardt CC and Heerikhuizen H (1997) Functional characteristics of heterologously expressed 5-HT receptors. Eur J Pharmacol 334: 1-23. Gobert A, Rivet JM, Lejeune F, Newman-Tancredi A, Adhumeau-Auclair A, Nicolas JP, Cistarelli L, Melon C, and Millan MJ (2000) Serotonin2C receptors tonically suppress the activity of mesocortical dopaminergic and adrenergic but not serotonergic pathways: a combined dialysis and electrophysiological analysis in the rat. Synapse 36: 205-221. Govitrapong P, Prapapanich V, and Ebadi M (1991) Identification of serotonin 5-HT2 receptors in bovine pineal gland. J Pineal Res 11: 182-187. Herrick-Davis K, Grinde E, and Niswender CM (1999) Serotonin 5-HT2C receptor RNA editing alters receptor basal activity: implication for serotonergic signal transduction. J Neurochem 73: 1711-1717. Jenck F, Moreau JL, Mutel V, and Martin JR (1994) Brain 5-HT1C receptors and antidepressants. Prog Neuropsychopharmacol Biol Psychiatry 18: 563-574. Kennaway DJ and Moyer RW (1998) Serotonin 5-HT2C agonists mimic the effect of light pulses on circadian rhythms. Brain Res 806: 257-270. Kennett GA, Trail B, and Bright F (1998) Anxiolytic-like actions of BW 723C86 in the rat Vogel conflict test are 5-HT2B receptor mediated. Neuropharmacology 37: 1603-1610. Kopp C, Vogel E, Rettori MC, Delagrange P, and Misslin R (1999) The effects of melatonin on the behavioural disturbances induced by chronic mild stress in C3H/He mice. Behav Pharmacol 10: 73-83. Liu C, Weaver DR, Jin X, Shearman LP, Pieschl RL, Gribkoff VK, and Reppert SM (1997) Molecular dissection of two distinct actions of melatonin on the suprachiasmatic circadian clock. Neuron 19: 91-102. Loôo H, Hale A and D'haenen H (2002) Determination of the dose of agomelatine, a melatoninergic agonist and selective 5-HT2C antagonist, in the treatment of major depressive disorder. A placebo controlled dose range study. Int Clin Psychopharmacol 17: 239-247. Lopez-Gimenez J, Tecott LH, and Palacios JM (2002) Serotonin 5-HT2C receptor knockout mice: autoradiographic analysis of multiple serotonin receptors. J Neurosci Res 67: 69-85. Millan MJ, Gobert A, Rivet JM, Adhumeau-Auclair A, Cussac D, Newman-Tancredi A, Dekeyne A, Nicolas JP, and Lejeune F (2000a) Mirtazapine enhances frontocortical dopaminergic and corticolimbic adrenergic, but not serotonergic, transmission by blockade of α2-adrenergic and serotonin2C receptors: a comparison with citalopram. Eur J Neurosci 12: 1079-1095. Millan MJ, Lejeune F, and Gobert A (2000b) Reciprocal autoreceptor and heteroreceptor control of serotonergic dopaminergic and noradrenergic transmission in the frontal cortex: relevance to the actions of antidepressant agents. J Psychopharmacol 14: 114-138. Millan MJ, Peglion JL, Lavielle G, and Perrin-Monneyron S (1997) 5-HT2C receptors mediate penile erections in rats: actions of novel and selective agonists and antagonists. Eur J Pharmacol 325: 9-12. Nebigil CG and Maroteaux L (2001) A novel role for serotonin in heart. Trends Cardiovasc Med 11: 329-335. Newman-Tancredi A, Conte C, Chaput C, and Millan MJ (1997) Inhibition of the constitutive activity of human 5-HT1A receptors by the inverse agonist, spiperone but not the neutral antagonist, WAY 100,635. Br J Pharmacol 120: 737-740. Overstreet DH, Pucilowski O, Retton MC, Delagrange P, and Guardiola-Lemaitre B (1998) Effect of melatonin receptor ligands on swim test immobility. Neuroreport 9: 249-253. Papp M, Gruca P, Boyer P-A, and Mocaër E (2003) Effect of agomelatine in the chronic mild stress model of depression in the rat. Neuropsychopharmacology 28: 694-703. Redman JR and Francis AJP (1998) Entrainment of rat circadian rhythms by the melatonin agonist S-20098 requires intact suprachiasmatic nuclei but not the pineal. J Biol Rhythms 13: 39-51. Reppert SM (1997) Melatonin receptors: molecular biology of a new family of G protein-coupled receptors. J Biol Rhythms 12: 528-531. Rosen RC, Lane RM, and Menza M (1999) Effects of SSRIs on sexual function: a critical review. J Clin Psychopharmacol 19: 67-85. Sharma A, Punhani F, and Fone KCF (1997) Distribution of the 5-hydroxytryptamine2C receptor protein in adult rat brain and spinal cord determined using a receptor-directed antibody effect of 5, 7-dihydroxytryptamine. Synapse 26: 45-56. Skene DJ, Bojkowski CJ, and Arendt J (1999) Comparison of the effects of acute fluvoxamine and desipramine administration on melatonin and cortisol production in human. Br J Clin Pharmacol 37: 181-186. Souetre E, Salvati E, Belugou JL, Candito M, Krebs B, Ardisson JL, and Darcourt G (1989) Circadian rhythms in depression and recovery: evidence for blunted amplitude as the main chronobiological abnormality. Psych Res 28: 263-278. Szymanska A, Rabe-Jablonska J, and Karasek M (2001) Diurnal profile of melatonin concentrations in patients with major depression: relationship to the clinical manifestation and antidepressant treatment. Neuroendocrinol Lett 22: 192-198. Tuunainen A, Kriptke DF, Elliott JA, Assmus JD, Rex KM, Klauber MR, and Langer RD (2002) Depression and endogenous melatonin in postmenopausal women. J Affective Disorders 69: 149-158. Van Reeth O, Weibel L, Olivares E, Maccari S, Mocaër E, and Turek FW (2001) Melatonin or a melatonin agonist correct age-related changes in circadian response to an environmental stimulus. Am J Physiol 280: 1582-1591. Weibel L, Retorri MC, Lesieur D, Delagrange P, Renard P, and Van Reeth O (1999) A single oral dose of S22153, a melatonin antagonist, blocks the phase advancing effects of melatonin in C3H mice. Brain Res 829: 160-166. Yamamoto BK and Novotney S (1998) Regulation of extracellular dopamine by the norepinephrine transporter. J Neurochem 71: 274-280. Ying SW, Rusak B, and Mocaër E (1998) Chronic exposure to melatonin receptor agonists does not alter their effects on suprachiasmatic nucleus neurons. Eur J Pharmacol 342: 29-37. Yous S, Andrieux J, Howell HE, Morgan PJ, Renard P, Pfeiffer B, Lesieur D, and Guardiola-Lemaiôtre B (1992) Novel naphthalenic ligands with high affinity for the melatonin receptor. J Med Chem 35: 1484-1585. Zisapel N (2002) Melatonin-dopamine interactions: from basic neurochemistry to a clinical setting. Cell Mol Neurobiol 21: 605-616.